Many of us heard about the tragic Rana Plaza factory collapse in Bangladesh last spring, but here's another horrible connection between the garment industry and suffering in that beautiful country: pollution so bad that it's sickening the children and destroying the land. Bangladesh’s garment and textile industries have contributed heavily to what experts describe as a water pollution disaster, especially in the large industrial areas of Dhaka, the capital. Many rice paddies are now inundated with toxic wastewater. Fish stocks are dying. After you read the entire article, head to your closet and check your labels. Do any report that they're "made in Bangladesh?" Mine do. 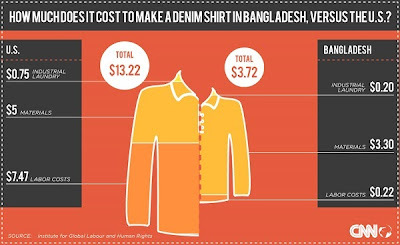 "I've created jobs in Bangladesh," I used to think to justify such cheap purchases. But are these jobs creating more suffering than they're eradicating? The World Bank quietly announced that Bangladesh reduced the number of people living in poverty from 63 million in 2000 to 47 million in 2010. Do you know of any other books to share with your children or students about Bangladesh? If so, please leave them in the comments.